Caused by: infection with the bacterium Anaplasma phagocytophilum, spread through the bite of infected ticks. The blacklegged tick (or deer tick, Ixodes scapularis) spreads the disease in the northeastern and upper Midwestern United States, and the western blacklegged tick (Ixodes pacificus) spreads the disease in Northern California. It may also be transmitted through blood transfusions. Long-term effects: difficulty breathing, hemorrhage, renal failure or neurological problems. 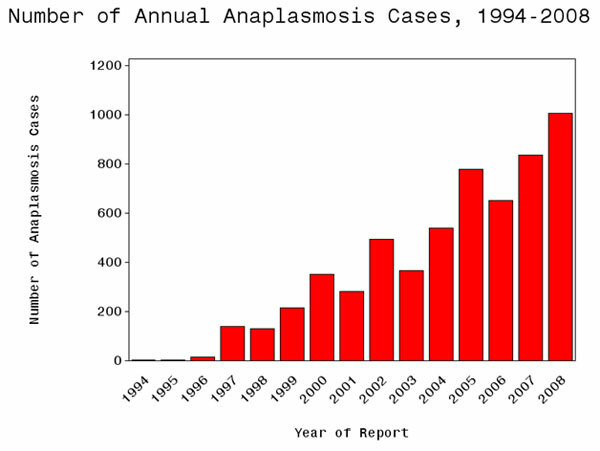 Anaplasmosis can be fatal if left untreated (estimated fatality rate is less than 1%). Diagnostic tests based on the detection of antibodies will frequently appear negative in the first 7-10 days of illness…The diagnosis of anaplasmosis must be made based on clinical signs and symptoms, and can later be confirmed using specialized confirmatory laboratory tests. Treatment should never be delayed pending the receipt of laboratory test results, or be withheld on the basis of an initial negative laboratory result. Rifampin is sometimes used for treatment of pregnant women and people with allergies to Doxycycline. However, some studies caution against treating Anaplasmosis with Rifampin alone because some strains of bacteria become rapidly resistant to the drug. (You can read more about this here.) For this reason, some doctors prescribe Rifampin in combination with ciprofloxacin. Anaplasmosis may be confused with other tick-borne rickettsial diseases like Rocky Mountain Spotted Fever (RMSF) and ehrlichiosis. All three of these infections can be treated successfully with Doxycycline. Because Anaplasmosis and Borrelia burgdorferi (Lyme) are spread by the same ticks, patients who test positive for Borrelia burgdorferi should also be tested for antibodies to Anaplasma phagocytophilum. Want to read more about Anaplasmosis? Visit the CDC’s information page.